S.P. Balasubrahmanyam talks to SUBHA J RAO about hosting music reality shows on television, his stint in films, and memorable moments from his impressively long musical journey. His dulcet voice has made people fall in love; broken hearts have sought refuge in his pathos-drenched numbers; the young have revelled in his zesty rendition. And, at 65, S.P. 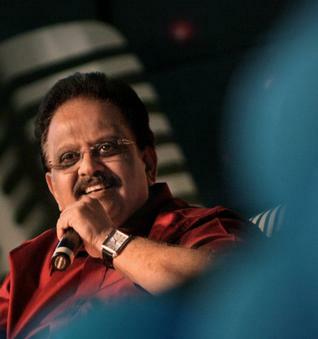 Balasubrahmanyam continues to hold people in a thrall. Success sits lightly on the singer, credited with over 36,000 songs. Not for him fancy drinks and gourmet foods. He's a man who loves buttermilk and bananas — they kept him going when he was recording non-stop in his heydays. Dubbing and acting beckoned. So did a career in television with shows that identified new talent. SPB hosts the hugely-popular Paadutha Theeyaga (ETV Telugu) and Edhe Thumbi Haaduvenu (ETV Kannada). He continues to record — for films, for TV and for albums. Yet, the singer, who has a string of National Awards to his credit besides the Padma Shri and Padma Bhushan, says he does not have a visiting card. “I've been postponing getting one for four decades now,” he smiles. But then, his voice is his calling card. YOU'VE MADE A HUGE PLACE FOR YOURSELF ON TELEVISION. I'm grateful to television. It has made me more accessible to the viewer. As for the shows, I'm merely passing on what I learnt from my seniors; they gave me a chance and corrected my mistakes. I believe a reality show related to music must nurture talent and put participants on the right path. It should not pit people against each other for the sake of TRPs. Luckily, my producers see sense in this format. IS WINNING OR PARTICIPATING MORE IMPORTANT? Participating. I always tell the kids they should be gracious in defeat. You can't stop the odd tear, but learn to acknowledge the winners with a smile. This is probably why many children who took part in the show a decade ago still come to the sets; they love the experience. HOW WAS IT MAKING YOUR ACTING DEBUT UNDER K. BALACHANDER? Once, after some friends and I put up a show in Madras, KB sir approached me for ‘Manadhil Urudhi Vendum'. I was convinced I would fare badly. The scene to be shot that day was one where I give up smoking. I improvised — lovingly held the cigarette, smelt it one last time and dropped it into the bin with a mangalam. He loved it. YOU'VE SUNG IN SO MANY LANGUAGES. HOW HAVE YOU MANAGED TO KEEP ITS NUANCES AND POETRY INTACT? Composer M.S. Viswanathan first turned me down because my Tamil pronunciation was bad! But, practice worked magic. All languages are beautiful — their sounds are musical. Understanding the lyrics is vital to singing well. That way, you keep the faith of the person who gave you the song, and the faith of the listener. AFTER ALL THESE YEARS, YOU SAY YOU APPROACH EVERY SONG LIKE IT IS YOUR FIRST ONE. I still prepare before every song. Once the final take is done, you can't correct mistakes. Even now, when I listen to my songs, I feel sad I did not do justice to some of them. AT THE PEAK OF YOUR CAREER, YOU WERE OPERATED UPON FOR A NODULE IN YOUR VOCAL CHORDS. KNOWING THE RISK INVOLVED, IT MUST HAVE BEEN A DIFFICULT DECISION. One day, I stood in front of the microphone and could not hold a note. This continued for 15 days. Songs kept piling up; I felt frustrated and suffocated. Then, I decided to go in for surgery, knowing I might lose my voice. Well-wishers including Lataji (Mangeshkar) counselled me against it. But, I wanted the trauma to end. Luckily for me, I resumed singing. And, was back in the dubbing theatre on the 62nd day! YOU RULED THE CHARTS WITH YOUR HINDI NUMBERS TOO. It all started with ‘Ek Duje Ke Liye'. Laxmikant-Pyarelal were a little hesitant to take me on board, but later declared I was the only playback singer around! Pancham, Naushadji… all of them are responsible for my success. So are my co-singers. Ashaji was such a dear. I still remember recording for ‘Teri Payal Mere Geet'. After I sang, Naushadji was silent before saying the take was perfect — those were the longest 30 seconds of my life. IT'S BEEN SUCH A LONG JOURNEY IN MUSIC. ANY INTERESTING VIGNETTES? When recording for ‘Chikku Bukku Rayile', A.R. Rahman would narrate how difficult it was to get his nephew to stand in once place and sing; the child would run all over the place with the microphone. Today, I've sung for the nephew too. What a composer G.V. Prakash has turned out to be! He's a favourite. He gives importance to the lyrics. I feel blessed I've sustained my voice this long.